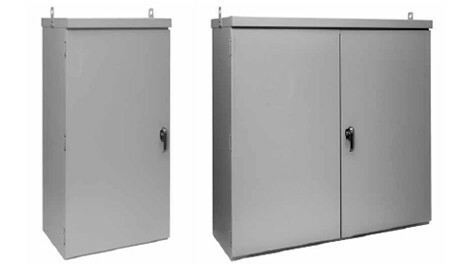 Weatherpro Outdoor Pad Mount, Type 3R Enclosures and Accessories Applications: Weatherpro Outdoor Pad Mount Enclosures protect controls, drives, power distribution components or contactors in outdoor commercial or industrial power distribution and control applications. The overlapping two-door models with no center post allow full-width access to enclosure interior. Download the Weatherpro Outdoor Pad Mount, Type 3R Enclosures and Accessories spec sheet below or call 714.835.6211 for more information.